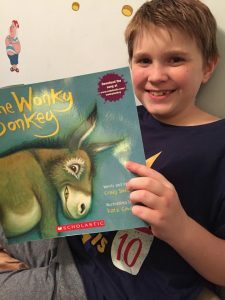 The Wonky Donkey (hilarious children’s book) AND Sticker Book | Perfect Gift Idea! 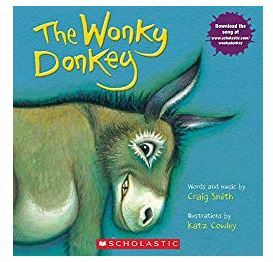 You can currently order The Wonky Donkey for $7.83! It will be in stock on October 27th. So plenty of time to get it for Christmas – but don’t wait too long! I gave it to G for his birthday today. We read it at bedtime. We took turns reading it at bedtime tonight. I have some hilarious video of G trying to get through it! 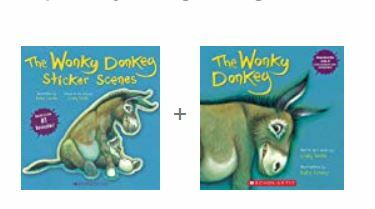 Make it the perfect gift when you also get The Wonky Donkey Sticker Scenes book so the kids can play along with stickers while you read! Just click here and scroll down until you see the “Add Both to Cart” button. If you haven’t seen the video of the grandma trying to read The Wonky Donkey to her grandson, you need to see it!